Leogang, July 13th – Sam Pigrim wins the biggest 26TRIX ever, Andreu Lacondeguy takes home the Oakley Sick O Award with a 40ft. 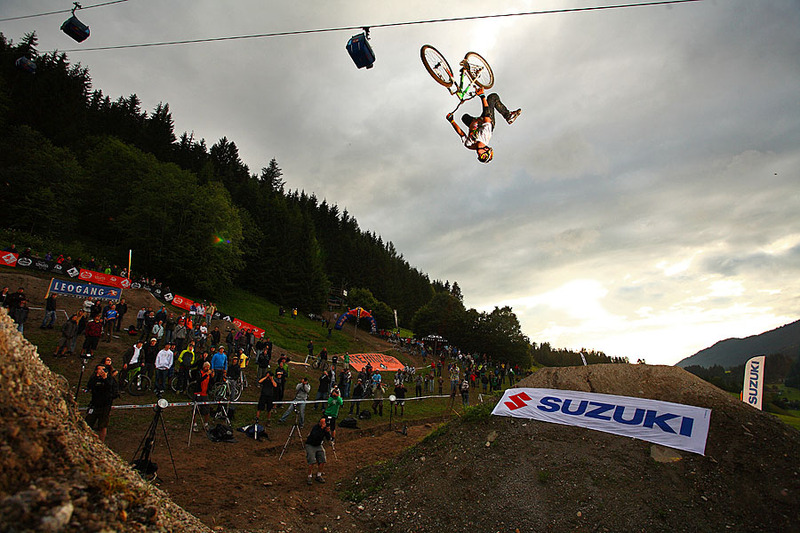 flatspin on the Suzuki Air Time Line and Martin Söderström won the wildcard to Whistler’s Crankworx. Nick Beer wins the iXS European DH Cup and Boris Tetzlaff becomes Austrian Downhill Champion. Graham Agassiz and Kona Euro riders Pascal Breitenstein and Niki Leitner with top ten finishes. The Out of Bounds Weekend started with a 26TRIX practice day on Thursday and riders slowly got used to the new course. Especially the riders that had to qualify still struggled with the dirt jump course, which had 9 hits. This year, riders could pre-register and had the chance to ride two qualifying runs in order to make it to the finals and compete with 21 invited pros. The 2009 26TRIX course had a new big line, which is called the Suzuki Air Time Line. During the qualifying none of the 35 competitors gave it a try over the big jumps. It was Niki Leitner from Vienna, Austria, who got first in the qualifiers: he tricked every jump with tricks like huge superman-seat grabs, flips, or 3’s. Niki and eight other riders were the lucky ones to make their way into the training for the finals with the other pro riders. That practice showed why you had to qualify to ride with the pros. Greg Watts and Graham Aggasiz were the first two riders to hit the big Suzuki Airtime Line. They had to pedal hard in the concrete berm and right up to the take off of the first gap, which was a solid 40ft. gap. A few more pros joined them but most of them had troubles to make it over the second jump. So the course builders decided to cut the lip and the landing by 2-3ft to make it easier to clear the gap. And it was still a 8ft. take off and a 25ft. gap. After showing flips at the first 40-footer and 360’s at the second it was clear that the judges want the riders to do the big jumps in order to have a chance to win that contest! But first, the spectators saw an amazing run on the small line from Sam Pilgrim: featuring 360-tables, backflip no hands, frontflips and double whips that put him in the lead. But then it was Greg Watts, who made his way into the Suzuki Air Time Line and showed a huge backflip and X-up one foot on the two big hitters along with a few barspins at the little jumps before. Greg finished big with a flipwhip at the final jump. He took first place for a little while. The other riders now had to show, what they are made of: Darren Berrecloth showed clean 360s on the Suzuki Airtime Line as well as impressive opposite 360 table top one foots at the last jump and therefore became fourth. The well known European rookie Martin Soderstrom hit the regular line with a huge 360 and a superman seat grab, followed by a sick 360 tailwhip in midst of the line, then a tailwhip at the step-down and a 360 at the hip and a double whip at the last jump! No question, he definitely deserved third place. Andreu Lacondeguy, who was one of the favorites for the whole comp crashed in the first two runs, when trying a backflip at the first step up directly after the start. In his third run, he made his way directly in the Suzuki Air Timeline and pulled a huge flatspin 360, but he lost speed, and was not able to end his run. Anyway, the spectators just went nuts and were jelling for minutes! The judges liked his flatspin on this weekend also best and awarded Andreu with the Oakley Sick O Award! Please watch all the action on www.konaworld.tv, where two clips are available, one of the trainings and qualifications as well as one of the finals on Saturday. But the Out of Bounds weekend was not only about the 26TRIX’s first class dirt jump action. 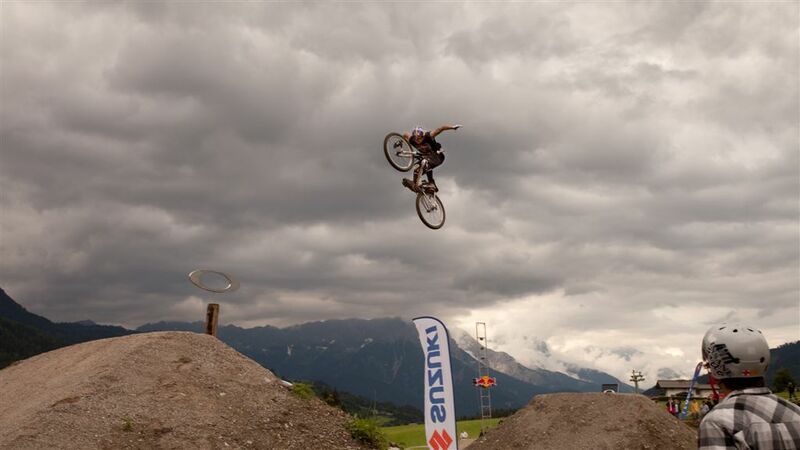 A tour stop of the iXS European Downhill Cup, including the Austrian Championships, hit Leogang, too. European Champion Nick Beer (SUI) took home the win in front of his brother Marcel and the German speed master Marcus Klausmann. The new Austrian downhill champion is Boris Tetzlaff who was the best Austrian rider, on sixth place. For more detailed information, please visit: www.ixsdownhillcup.com. The happy winners of the charity raffle in favor of Wings for Life have been also drawn during Out of Bounds Weekend: Maurizio Di Berardino obviously did not only buy a lot of charity tickets, but was also very lucky: Maurizio, you won the first AND the second price, a Kona Stinky bike and one week for two persons in Leogang! On top, Andreas Stöffler can look forward to a seasonal ticket for the Bike-Circus Saalbach Hinterglemm Leogang. Congrats to you, Andreas, you won the third prize of the Wings for Life raffle. The “De Buam” after party totally rocked the sports centre Leogang. The last guests left for their way home in the early morning hours and some of the riders even partied till their shuttle left for the airport. Don’t miss the Out of Bounds Festival next year from June 24th to 27th 2010!